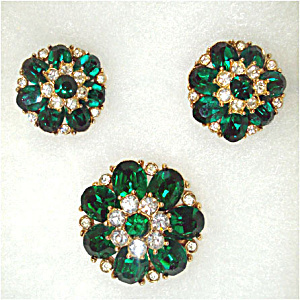 Pretty demi parure with pin and matching clip earrings in clear and emerald green sparkling rhinestones in a goldtone round flower setting. The center round green stones are ringed by seven clear white rhinestones, raised above the base ring of seven faceted oval green stones separated by tiny clear stones. 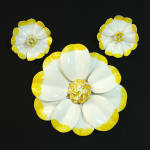 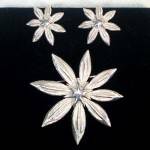 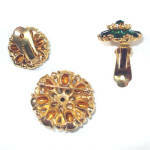 The brooch is 1-3/8" diameter, the earrings a bit smaller at 7/8" diameter. 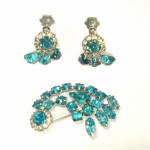 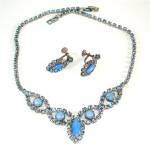 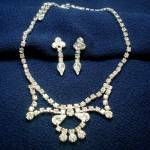 The unmarked jewelry set is in excellent, clean condition with no damage or wear, the stones brilliant and sparkling. 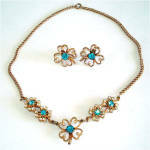 Will be shipping in a vintage gold foil gift box.